Whenever I make an Item infinitely it would sometimes take the item from the Silo stacks but not complete the craft. Like when I'm crafting a battleship cannon it has that item made by 2 rodius and a carbite, it will pull the required items but sometimes will skip the components factory even though its requesting them. It sounds like you may be describing the known bug which happens when you add a Component Factory *after* the Fabricator you are using. Or maybe when you have 2 Refineries causing the allocation to alternate and let raw resources past. But I'd need to see a save or snapshot of your crafting tech to be sure it's not something new (as I've seen weird new, semi-random behaviours in 0.8 and 0.8.1. I've added "[0.8.1]" to the title (is this correct?) and moved the thread to the "Bugs" section, as this is a stable version number (oddly). Well the factory section is on a loop of 8 component factories and the fabricators are located outside the loop. It seems similar to what happened to @QuackDuck reported here. Also, crashing issues with disjointed conveyors here. I think I've seen something like what you've shown in your video happening inexplicably too. But I'd need to poke at your setup, in action, to check that it is not just experiencing known bugs (a couple look similar). This is what the conveyor line is supposed to be The green is the storage line from scrappers while the blue line is the crafting line. Having a separate line for the storage means that I can queue up a lot of items for scrapping with no worries of affecting crafting. Although I wonder why the conveyor lines became messed up it wasn't in the snapshot. Oook. I managed to reconstruct your tech from that (a right pain trying to get parallel conveyor lines to flow as desired - hence why I always avoid using them). I really wish you'd sent a save. Anyway. Yeah - I also see the kind of behaviour shown in your video. And it's not down to this known bug (when a Fabricator's added before Component Factories). I replaced the Fabricator to be sure. The superfluous resources sent, here, changed each time I re-ran the save (attached). From identical starting positions... So it seems that it's a non-deterministic bug, as far as the user is concerned. @kae - for reference, I crafted the same block as @JuanPinoy - a Seeker missile pod from the Hawkeye Fabricator on the far right corner. I'd seen hints of this previously (pre-0.7.9) when using my highest throughput crafter, with all 3 conveyor lines churning out missiles at full speed. But never to this extent. Burdening my GPU and CPU (using an external program) appeared to have no discernable effect on the result of testing, either with the original (big) base, or the contracted version I made (which always worked pretty much OK). So it may be a case of too many silos? Generally I tend to store my resources in geocorp blocks as its easier to reach rather than hawkeye ones for mass storage. Also I dont know if you've experienced it but sometimes component factories will not craft even if the resources required are already in the loop it will fill one of the two components but not the other. sometimes component factories will not craft even if the resources required are already in the loop it will fill one of the two components but not the other. Do you mean that it sometimes won't even call the necessary resources out of the silo, when they are sat there? As opposed to what we're seeing above, with the needed resources repeatedly bypassing them and looping around. No the resources repeatedly pass the component factory. Do you mean crafting each component manually from the Component Factory right click interface? quick question where do I find my saves? Note! - File directory location was moved as of Unstable 0.7.9.1 (see patch notes). I.e. 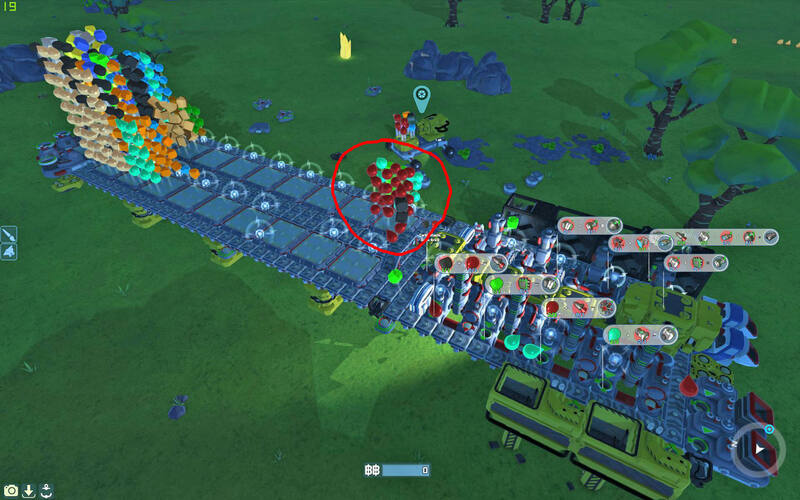 to "C:\Users\[Username]\Documents\My Games\TerraTech" on Windows 10. I'll take a look into this, although this might be the same thing Django has an older bug in for, thanks for reporting guys!